Learn more about our employee Benefits and Compensation. We're located in Sacramento, the capital city of California. It's conveniently situated near first-rate cultural and recreational centers such as San Francisco, Lake Tahoe, Napa Valley, the Sierra Nevada mountains and foothills, California coastline, and various wine regions. You can enjoy the variety of activities Sacramento has to offer – such as fishing, boating, art, theater, and a hometown family environment – or take a two-hour drive in any direction to enjoy camping, skiing, and other resort activities. Lincoln Plaza is conveniently located near regional public transportation. Our Alternative Commute Program offers a variety of commute assistance alternatives to employees. We also have eight Regional Offices located throughout the state. Our job is to provide world-class service. Our continued commitment is to bring value and security to public employees' retirement. 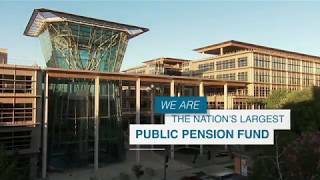 Learn more about the CalPERS Story. Our culture is surrounded by our Core Values of Quality, Respect, Accountability, Integrity, and Balance. We value our employees and recognize our people are our most important asset. Our Informal Mentoring Program and diverse and inclusive environment are a few examples of employee-centric strategies we use to ensure we continue to nurture a diverse, talented workforce. Mentoring seeks to build on the existing strengths across the organization. Unlike traditional mentoring programs, mentoring here can be as simple as two or more people getting together to share ideas and knowledge with the goal of learning. View our videos to learn how informal mentoring has inspired our employees. Workplace - We actively educate our leadership and staff to increase D&I awareness, understanding, and skills that lead to greater quality, respect, and accountability. Marketplace - We serve our members with sensitivity to their diverse perspectives. Our business partners include Small Business and Disabled Veteran Business Enterprise firms. We are the nation's largest public pension fund, within one of the most ethnically and culturally diverse states. We believe the combined experiences, perspectives, and talents of all employees and stakeholders strengthen our high-performance work culture and organization. Our differences are our strengths. View the CalPERS Commitment to Diversity & Inclusion Report for more information.